I have been quilting for just about 3.5 years. When I was pregnant with my son I wanted to make a bunch of things for his nursery and began searching the internet for inspiration. 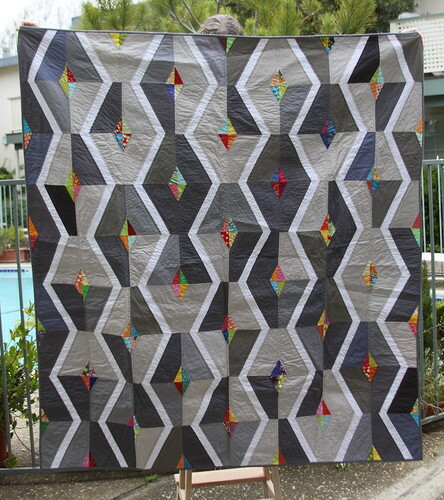 In the process I stumbled upon a number of modern quilt blogs, including AmysCreativeSide, and I was completely hooked! Since then I have completed approximately 15 quilts, and a number of smaller quilted items. Quilting is a creative outlet for me. I am a software engineer by profession, and I have always needed to balance all of my work with computers, which is essentially all in our heads, with creating something real and tangible. When I was young it was primarily drawing, but I always always frustrated that I never really could do anything with the drawings in the end other than store them away in a portfolio in the back of a closet somewhere. 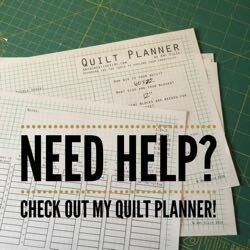 With quilting, I can create, and enjoy surrounding myself with my creation and see my family using it on a regular basis. 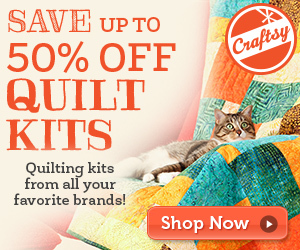 I also love to give away my quilts. There is something special about knowing that they can wrap themselves up in your gift for comfort, and that they will remember that you cared for them enough to create it just for them. I actually just finally completed my first quilt that stayed with us in our home a few months ago, believe it or not. I find it very soothing to myself as well, to think about them, what they mean to me, and how they will enjoy the quilt during the entire time it takes to make the quilt. I suppose there is also an element of pride. I am proud of what I have created, and want to share it. It is not entirely unlike when we were children, bringing our drawing for mommy to see and have proudly displayed on the refrigerator. I think for many of us who blog, there is some internal drive not just to create, but to share that creation with others. That somehow a new idea becomes more when it is shared with others, where some one else may derive some joy from it, or be inspired by it to go off and do something else entirely new based on a thought it triggered. It makes us part of a community creating and pushing our art forward. Think how sad it would be if some of our most famous painters or other artists had never revealed their art, but kept it hidden from others? If we never got to see any Picasso? Or Michelangelo? There is something about sharing art with others that truly brings it to life. 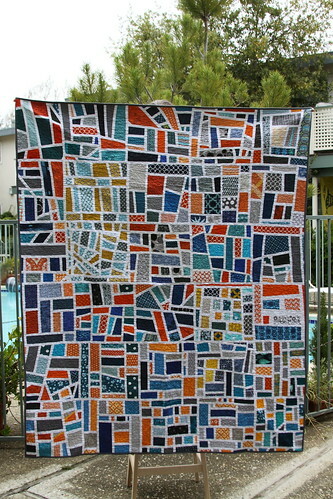 The quilt I shared last Spring was very special to me. It was designed for a friend of mine who was about to under go a fairly serious surgery. The fabric and the pattern were each selected to her tastes. This quilt was particularly special to me because this friend was also a quilter, so I knew she’d know just what went into a quilt, and what it meant. It reminds me of all of the hours we have spent chatting about fabric, quilt patterns, and quilting techniques. I think any time we create a quilt for someone we value having in our life, it means something more to us. I have a super amazing husband and son that put up with me consistently covering the house with bits of fabric and thread while I create. I love you guys! Thanks for sharing Kelsey! I love the cheerfulness of your quilts. 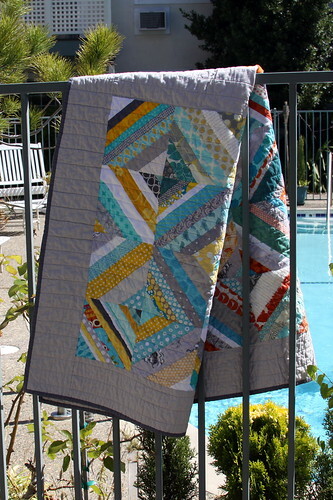 Loved reading more about you and your quilting, and that mod mosaic is stunning!